This really should have been a much quicker make than it turned out to be. But that’s ok, because I made it fit properly pretty well and learned a few things along the way. And discovered that I actually really enjoyed the whole process. It is McCall’s M6604 view C. First up is that this pattern is really short. I added 2.5cm to both back and front and then another 5cm or so in the shaping on the front. When I make it again, which I will, I’ll add at least another 2.5cm to the back. So the first thing to go wrong was that I cut a size 20, sewed the pleats, and shoulder seams and then tried it on. It was huge but then that’s no real surprise is it? As I mentioned once before, it is all very well to measure the pattern pieces and work out the ease, but I’m still learning how much ease I like and how a certain amount of ease looks. But anyway, I recut the size 18 and it’s much better. 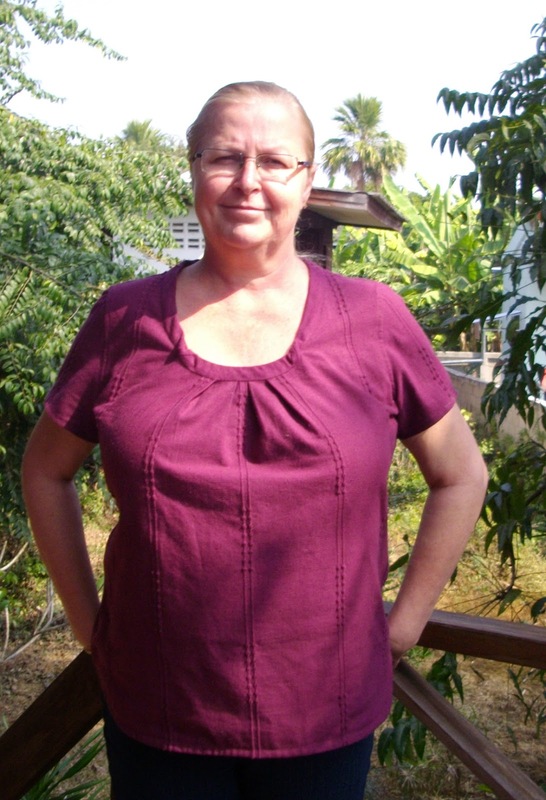 I did a 2cm forward shoulder adjustment and used Heather’s fabulously easy tutorial to also adjust the sleeves. I also took 1cm off at the top of the shoulder. And then I put in the sleeves. Looks pretty good, yeah? 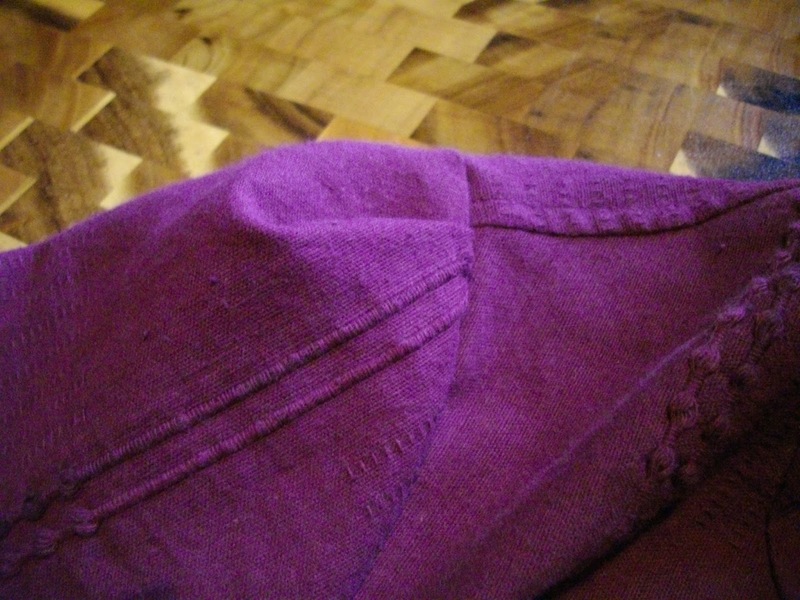 (Well except for the colour – this fabric photographs as a completely different colour in nearly every photo) But there is one small problem…. That is a rather large pleat in the sleeve. 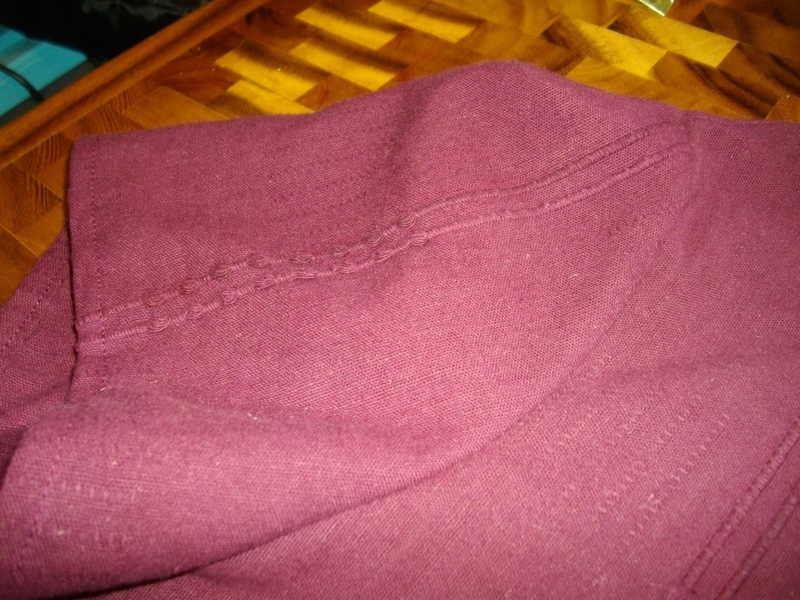 Talk about a generous amount of ease… I thought that a pleat might work as it would reference the front pleats. But it didn’t – it just stuck out rather awkwardly. So I looked for tutorials on how to fix this. There are a lot. However, most of them presume (quite rightly) that you want to make an adjustment to the pattern before you cut the fabric. I, of course, needed an on the fly fix for an already cut (and hemmed) sleeve. Casey’s tutorial was just what I needed. I will also try to remember to check this on future garments BEFORE I cut them out. After that it was all smooth sailing. This is supposed to show my excellently placed shoulder seams and pretty damn good sleeves (maybe still need a small tweak at the back) but all I can see is … b00bs. I swear they don’t stick out that far in real life. And the obligatory back view. I do sometimes wonder if I need some kind of back adjustment. But I think I can’t need a sway back, because I have a flat bum but then I read somewhere the other day that that is precisely when you need a sway back adjustment. Can anyone shed any light on this for me? But still I’m pretty pleased overall with this top. A couple of tweaks and it might even be a TNT. 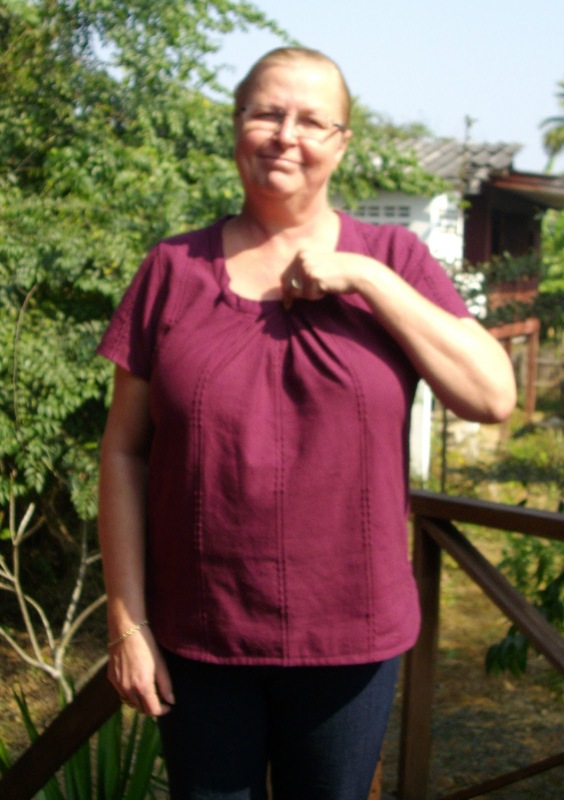 Which I do really need because when it is really hot you just can’t beat a simple woven top. So that turned into a really long post, didn’t it? Next time I will try to do a WIP post, which is what I should have done when I spent so much time faffing about with the sleeves. So how are your January plans going? And I would really appreciate any comments or suggestions you might have regarding achieving a better fit. Oh and don’t forget to leave a comment on my last post to win the Plus Size Pattern Pyramid. 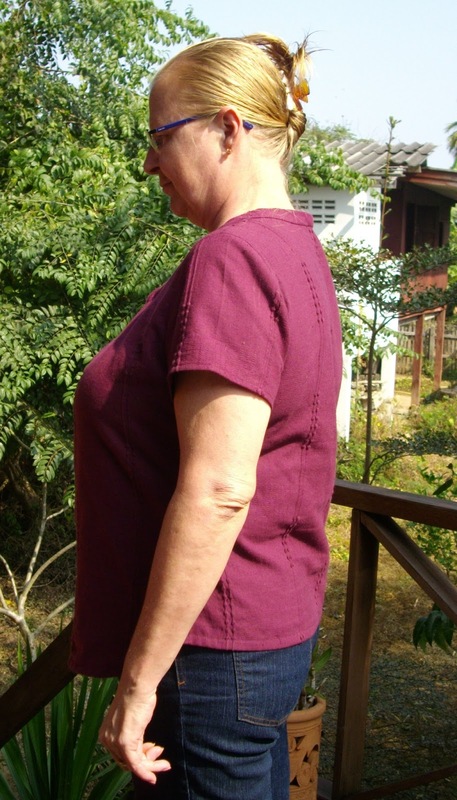 Your top looks pretty good and will be better with the right length neck band. 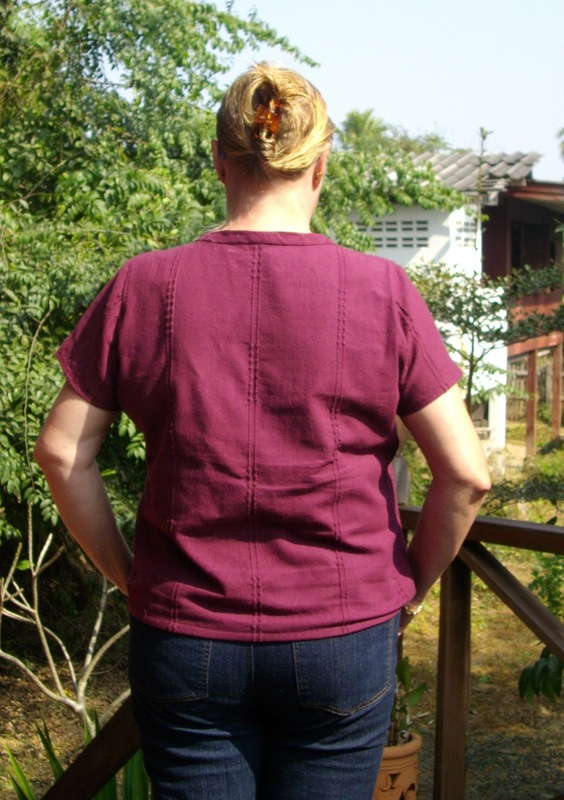 Isn't Heather's picture tutorial great for the forward sleeve adjustment, my January garment has used this tip as well. Interesting I didn't think sway back had anything to do with whether you have a flat bum or not it is just the way you stand. To me it looks like you do need a sway back, take the top off and pin a tuck out and put it back on and you might be surprised at how it looks. 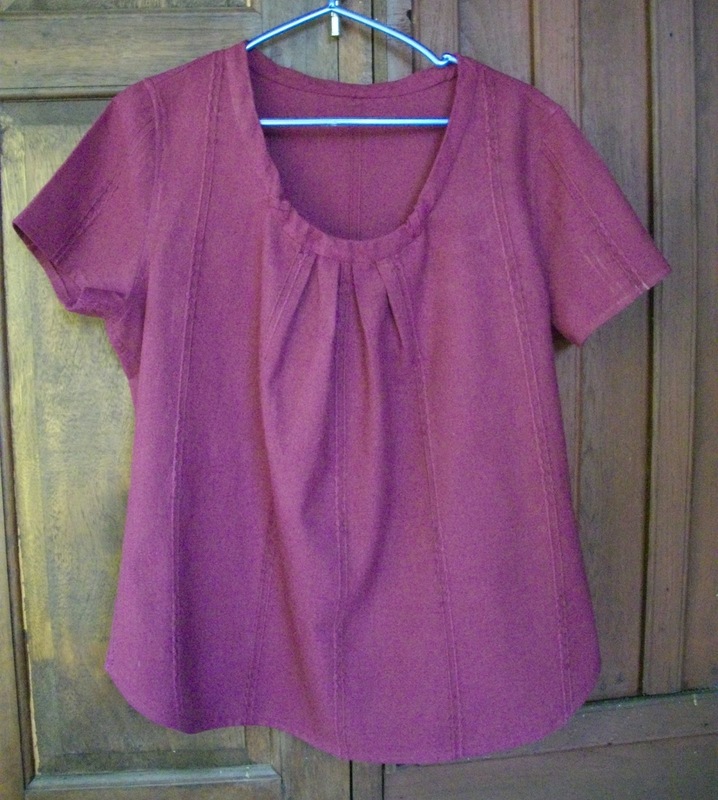 Love your blouse.. such a pretty color.. you have done a lot of work on getting the fit right.. I bet the next one,will be a lot easier. Happy sewing. Thanks, I will try pinning a tuck in the back to see how it looks. Thanks very much. And yes the next will be easier. I like it. On my monitor it is a pretty raspberry colour :-). The lengthwise lines in the fabric, mwuah, nice touch! YOu worked really hard on this garment; I respect the effort you put into it. I would have probably dropped the project .. oy vey. And yet, that is why I a here to up my sewing skills so ditching the project really should not be on my mind. Do you know what's going to be up for you in February yet? Girl, I have not even started my January MAGAM. Welll, I did lay out and pin the pattern pieces to see if I had enough fabric. Shhhhhh, don't tell Lady Sarah Liz, ha ha. I'm STILL telling myself I can get this done by 1/31!!!!!! Thanks very much, I'm quite pleased with it too. I know what you mean about ditching the project. However, I'm usually pretty good about soldiering on BUT I do often decide that 'it will do'.